Since the AIC2017, the international color conference, Color lab has participated in color conferences not only with academic papers but also with its outreach service having an independent booth. 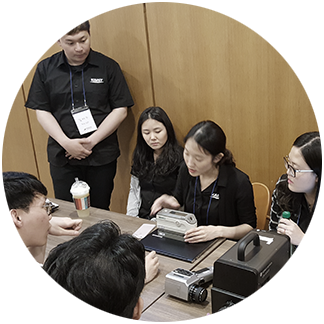 On May 19th on the Spring conference of Korea Society of Color Studies, Color lab brought with various kinds of colorimetry equipment and offered statistical analysis of measured color data. The activity intends to promote the research outcomes thereby building a network of color experts. Also, in a long-term, this exposure expects to find potential research members, partners, or industry collaboration.